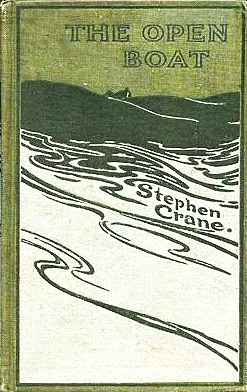 Originally published as, "Stephen Crane's Own Story" (1897), The Open Boat is based on the real-life ordeal Crane endured, when the boat he was taking to Cuba ran aground and sank off the Florida coast. Read more background on The American Literary Blog. They sat together in the same seat, and each rowed an oar. Then the oiler took both oars; then the correspondent took both oars; then the oiler; then the correspondent. They rowed and they rowed. The very ticklish part of the business was when the time came for the reclining one in the stern to take his turn at the oars. By the very last star of truth, it is easier to steal eggs from under a hen than it was to change seats in the dingey. First the man in the stern slid his hand along the thwart and moved with care, as if he were of Svres. Then the man in the rowing seat slid his hand along the other thwart. It was all done with most extraordinary care. As the two sidled past each other, the whole party kept watchful eyes on the coming wave, and the captain cried: "Look out now! Steady there!" Shipwrecks are _ propos_ of nothing. If men could only train for them and have them occur when the men had reached pink condition, there would be less drowning at sea. Of the four in the dingey none had slept any time worth mentioning for two days and two nights previous to embarking in the dingey, and in the excitement of clambering about the deck of a foundering ship they had also forgotten to eat heartily. "A soldier of the Legion lay dying in Algiers, There was a lack of woman's nursing, there was dearth of woman's tears; But a comrade stood beside him, and he took that comrade's hand, And he said: 'I shall never see my own, my native land.'" Crane's story is featured in our collection of Short Stories for High School. You might also enjoy the more light-hearted boating adventure novel by Jerome K. Jerome, Three Men in a Boat. Add The Open Boat to your own personal library.